Info Andrew James Peters was born 3 April 1872 in Jamaica Plain, a section of Boston. His family had been in Massachusetts since the first Andrew Peters arrived there in 1657. Peters attended Harvard and Harvard Law School. He served two terms (1904, 1905) in the Massachusetts State Legislature. 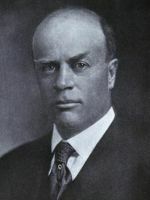 In 1906 he was elected to Congress where he would serve from 1907 to 1914. In 1914 he was appointed to be Assistant Secretary of the Treasury under William Gibbs McAdoo in the first administration of President Woodrow Wilson. He served there until 1918 when he began his term as Mayor of Boston. Peters term as Mayor is widely remembers for his handling of the the Boston Police Strike in 1919. Instead of calling out the state militia to maintain public safety (as he could) Peters tried to force the Republican Governor Calvin Coolidge to do it. For several days Coolidge tried to get Peters to act, and then finally had to act on his own. The result was criticized by labor union leader Samuel Gompers and Coolidge delivered a public rebuke of Gompers regarding the lack of right by labor unions to act against safety. Ironically Coolidge's actions made him a national figure, and led to his nomination to the Vice Presidency in 1920, his election, and his subsequent succession to the Presidency upon the death of Warren Harding. The reputation of Peters suffered because he failed to act. Peters was considered for the governorship later in the 1920s but not nominated. Peters' reputation also suffered due to his relationship with a young relative of his wife. He had married Martha Phillips in 1910, and they had six children. Mrs. Peters cousin, Mrs. Helen Faithfull, had a young daughter named Starr Wyman, later Starr Faithfull, who attracted Peters' attention. Eventually he had an affair with Starr, and paid money to her mother and stepfather to keep the story quiet. Starr died under mysterious circumstances on Long Island, New York in 1931. The story came out damaging Peters' reputation (despite his denials of it). The circumstances of Peters' relationship with Starr Faithfull eventually became part of the material used by John O'Hara in his novel Butterfield 8. Peters died of pneumonia on 26 June 1938.